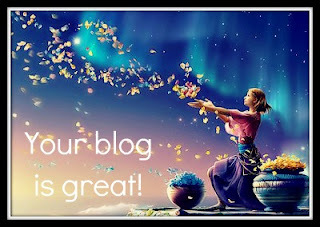 The lovely Jasmine at Sweetaholic Beauty has award me your blog is great award. Yea! Please make sure you check out her great blog. She is such a sweetheart. There are no restrictions to how many blogs you can award this to, but I'm going to choose my top 3 of the week! Sandy at Loveorsickaddiction is sooo talented with her eye looks. I award her this prize. Mia at Thatlovelyface has had some great photography in her posts this week. And it was her birthday. So I'm awarding this to her too. Lastly I'm awarding this to Votre-belle as she also has some great photography. She's also having a giveaway so be sure to check it out! Again, thanks so much Jasmine for this award and be sure to check out the great blogs I've tagged. You're welcome. Your work is truly amazing.